Summer is fast approaching, and many people are planning their summer trips. Here are some tips to help you make the best of your summer trip! Summer usually means it’s hot unless you are going far north or far south and keeping cool is on everyone’s minds. Stay hydrated – This may be obvious, but even I forget to drink enough water sometimes. The heat makes us loose water even faster. Staying hydrated will help keep you cool too! Wear light colored clothing – Dark clothes absorb light and heat. Light colors reflect them. Place a cold cloth around your neck – Usually, this means wetting the cloth, so this is best used at bedtime and will help you fall asleep even if it is roasting. This helped me a lot when I spent a few days in Italy during a summer heat wave and had no air conditioning. Wear a hat – Another obvious one, but not something I see a lot while traveling. It will also help protect you from the sun. Since lots of people are on vacation during the summer, choosing a hotel can be difficult. You have to find a room and find one at the right price for you. Near public transportation – This might help you save money. You should weigh the benefits of being far away from the sites and the cost of the hotel. It also depends on how long you have to visit. If you are staying longer than being a bit further might be okay. Close to the sites – If you have limited time or prefer to spend a bit more to be closer, then pick a hotel closer to the sites. Choose a hotel with air conditioning – Many hotels in Europe don’t have air conditioning. Which for some is fine, but other prefer to be cool when they arrive back from the heat. Most booking sites will have this as a filter option. Airbnb places might not have it, particularly in Europe and the ones that do might be more expensive. Check the meal options – If breakfast being offered at the hotel is important, check to make sure your rate includes it. It may be better to pay for it when you book the room as the cost on the day can be outrageous. I am not a fan of crowds, but in the summer they may be hard to avoid. This is how I keep my crowd exposure to a minimum. Go early – Going to the popular sites early in the morning will help you avoid crowds. Most people don’t want to get up early on their vacations and will sleep in a bit. I try to be at those sites when they open to avoid the crowds. It will also mean the lines will be shorter. Book in advance – Many popular sites will have advance ticketing options. Buy them in advance to avoid waiting in line. Just remember to print them out before you arrive. Go to lesser known sites in the afternoon – While everyone is hitting the big sites during the day, you can go to less popular locations in the afternoon. 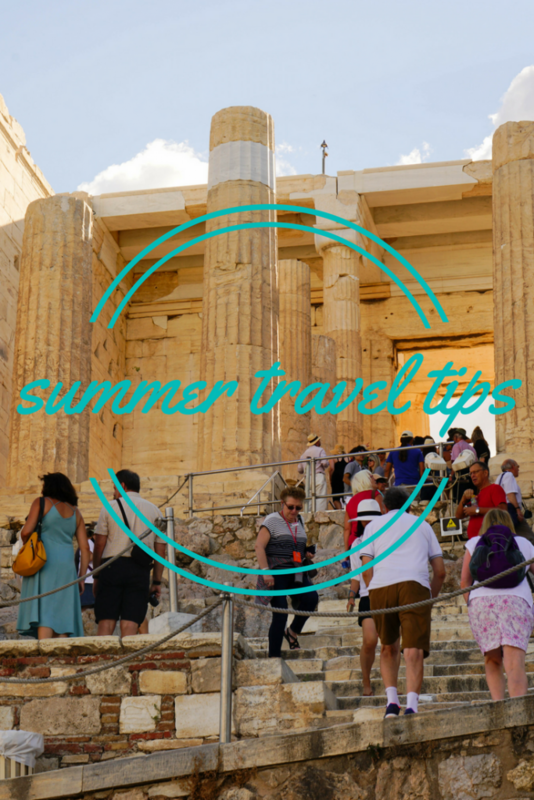 Find out when the cruise ships arrive – I was warned that the cruise ship passengers arrive at the Acropolis in Athens around 10 AM, so I made sure I was at the top by 10 AM so that I could avoid the big crowds going in. I also managed to get many pictures will no people in them this way! Your hotel might be able to tell you the schedule. Don’t enter from the main entrance – Some places have multiple entrances and will have longer lines and more crowds. At the Acropolis, you can enter from the south side, and only about ten people were waiting to buy tickets, and I had most of the walk up to myself. Walk – I love public transport, but walking is the best way to avoid large overcrowded subways in the summer. You can also pick a less popular route if you walk and it will be less crowded. This may not always be true in cities, like Florence, that are walking cities and have little public transport. What are your summer travel tips? Tell us in the comments. Never even thought about the arrival of cruise ships and whether places had different entrances. Something for me to think about in future! Thank you. I worked at a place once that depended on the cruise ship arrivals and I notice the crowds from them in Venice and Athens. Tiffany, Bologna in Italy is perfect for hot summer day walks as they have porticos [large verandas]. Though nothing like having a siesta to get over the worst of the day’s heat. It was over 40degs when we visited!! Loved Florence though the weather didn’t seem as hot, beautiful city to wander around. I didn’t know that about Bologna! Thanks for the tip. Oh yes, I love a good afternoon nap.